Disinformation releases clearly aspire, like Dr. Who’s TARDIS, to be something bigger on the inside than they are on the outside – loaded with hints, clues and allusions designed to tempt the listener into investigating further. 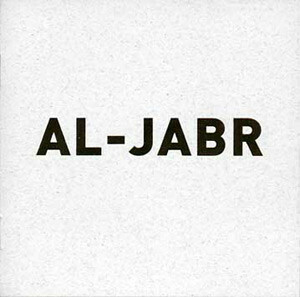 AL-JABR, Disinformation’s latest exercise in weapons-grade electronica, is certainly no exception. Its predecessor, ANTIPHONY (Ash # 3.4), presented the remix process as a parody of the techniques of traditional church music, while AL-JABR takes its central analogy from an underground publication which circulated in medieval Europe. The 9th Century astronomer, geographer and mathematician ABU JA’FAR MUHAMMAD IBN MUSA introduced European accountants to both ‘Arabic’ (ie Sanskrit) numerals, but also the system of symbolic mathematical reduction whose name corrupts into English from its Arabic form; equations as fractures, solutions as surgery, remixes as reunifications. For those not familiar with the Disinformation brand name, this project consists of DJing, publishing and live performance with recordings of unusual electromagnetic (ie radio) noise. On AL-JABR itself, rather than creating antiphonal responses to the original source material, the contributors ‘equate’ the raw material with their own idiosyncratic input; Lawrence Casserley transforms the rhythmic intricacies of how long data noise into a symphony of crushed and shattered slates; Evan Parker’s wailing saxophone complements the pulsating drones of the city’s power distribution networks, transforming the original ‘National Grid’, which was recorded live at the Museum of Installation, into ‘London’s Overthrow’, after the apocalyptic visions of the Victorian mystic and arsonist Jonathan Martin. The noise group Tactile take ultralongwave sub-bass radio noise generated by the TIG welders in sculpture/sound group Oubliette’s metal workshop, and recasts them as the ambience of ‘Pandemonium’ – the infernal underground city engraved by Jonathan Martin’s slightly saner brother John. Jim O’Rourke adds uniquely American humour and a rock ‘n’ roll analogue of National Grid. Simon Fisher Turner twists broadcast data noise into gorgeous rolling melodies. T:un[k] Systems’ track ‘Synaptic Radio’ pitches VLF band radio recordings of interference radiated by electrical storms against pristine lab pure sine waves – a vision of electrical-engineering-as-fine-art created by Disinformation for events at MOI and the South London Gallery. ‘Raxor’ by Mechos isolates individual lightning strikes and inserts them in a lattice of clicks and low frequency drones, whose deceptive simplicity belies the subtly disorientating effects of their unfolding, twisting rhythms. AL-JABR includes a text by the 17th Century watchmaker Robert Hooke, which suggests that noise has potential use as a diagnostic and can aid scientific investigative methods. If this CD has value beyond its specialised entertainment value, then it also shows that noise, as an artform, can demonstrate real conceptual and technical ingenuity, and can not only express visceral, cathartic intensity (ecstasy/ugliness/beauty/rage) but also explore complex and emotive anthropological and intellectual themes. the science of restoring what is missing and of equating like with like/the surgical treatment of fractures/ the bringing together of elements/the part of mathematics which investigates relations and properties of structures by means of general symbols. With R&D, STARGATE, GHOST SHELLS, and R&D2, Joe Banks (Disinformation) tuned his receivers and antennae to reveal inaudible radio frequencies, natural statics, and geomagnetic disturbances. His recordings opened ears and minds to the fascinating array of infrasonic events constantly occurring just above/below our limited range of hearing. The sprawling double-disc ANTIPHONY saw a stellar assortment of electronic musicians remixing Disinformation material, frequently to superb effect. AL-JABR effectively inherits ANTIPHONY’s mantle but, by inviting such unlikely candidates as erstwhile pop-star Simon Fisher Turner and eminent mimprovisational saxophonist Evan Parker to interpret R&D and R&D2, the project surpasses ANTIPHONY in breadth and scale. Turner seeks a pop backbone in Disinformation’s raw-matter but never finds it, despite dance innuendoes and ambient twiddlings. Mechos mimics the clicking Geiger counter signatures of decaying isotopes. Tactile’s swelling sub-bass can swallow you when experienced through a powerful subwoofer. Beware! ‘Booming Bass’, Jim O’Rourke’s meticulous collage of electronic trickery, contains everything but bass booming or otherwise. Lawrence Casserley and T:un[k] Systems respectively compress and dilate Disinformation’s atmospheric afterimages. Parker’s 13-minute ‘London’s Overthrow’ finds the legend blowing a labyrinthine pattern of tangled, circular tones over the throbbing discharge of alternating electrical currents. Unresolved and unpredictable, it is a brilliant exposition of the controlled universal chaos into which Banks’s recordings tap. fuelled backing and electronica with tinny saxophone refrains. Data noise, city power network droning and the pounding bass-line of radio noise are remixed, reworked and rechannelled into bites of music which are perversely very parallel. Interference via electronical storms are given a drum and bass-esque veneer and from all of this digital, cosmic sounding noise, come melodies and symphonies for a musically – bored pre-millenium generation.